With its ominous locations and steely blue-gray filters, it is clear from the outset that Lemony Snicket's A Series of Unfortunate Events is not your typical family fantasy. In fact, we are even warned by the narrator of the tale from the start that it is not, that bad things happen and people do in fact die. Heavy stuff for a film whose source material ranks as one of the more popular children's literary franchises today. Yet, while it is not hard to see perhaps a sliver of dramatic heft in the film, this is first and foremost a fantasy picture. In fact, you have likely never seen a world quite like the one in which Lemony Snicket lives. Lest anyone get the wrong idea, this is simply Lemony's tale to tell, as he narrates (sounding a lot like Jude Law) the story of the three Baudelaire children after their parents perish in a house fire. They are sent to live with their closest living relative who, unfortunately for the kids, happens to be Count Olaf (Carrey), an out of work actor who sees the kids as his tickets to getting household chores done and his chance to enjoy the large sum of money their parents left behind. The children inventor Violet (Browning), genius Klaus (Aiken), and infant Sunny (Shelby and Kara Hoffman) must be smart enough to outwit Olaf after they find their lives in danger. The danger in this case being Olaf's wish for the money and the catch that his inheritance is allowed only if the children, too, perish. After being stripped of his parental duties, he keeps appearing like a bad penny. First when the children are sent to live with their Uncle Monty (Connolly), later when they live with their Aunt Josephine (Streep). The series of Lemony Snicket novels expands each year�there are currently 11�and the filmmakers have chosen to combine the first three works in the series (The Bad Beginning, The Reptile Room, and The Wide Window), the choice of which helps here. By combining them, director Brad Silberling (channeling, amongst others, Tim Burton) and writer Robert Gordon have given the film a working balance of exposition and excitement. Though they have made an entertaining picture, there are more than a few things that faithful readers may notice missing and even some plot points that made more sense in the books. I mention above that Silberling seems to be channeling Tim Burton, and I honestly mean this as a compliment. The film very much has its own style as Silberling, cinematographer Emmanuel Lubezki, and production designer Rick Heinrichs give the film the sense of foreboding that it needs. This is a cinematic world unto itself with no real time or place; there are some recent products seen, while the cars and even the issue of Drama-Logue with a made up Lon Chaney on the cover suggest something else entirely. This is easily one of the most inventive and beautiful motion pictures to have been released in some time. It is worth mentioning that Silberling has three Sleepy Hollow alumni on board in Lubezki, Heinrichs, and costume designer Colleen Atwood and that without the trio's abilities, the film would have suffered strongly. If there is a flaw in the film it is a large flaw, with its name above the title. For me, Jim Carrey is not Count Olaf. This is not taking anything away from the performance, as Carrey shows his usual, incredible comedic talents here, but his over-the-top manner distracts from the character. Olaf is supposed to be an imposing figure that frightens the children and therefore the audience. With Carrey there is admiration but no menace�we don't see Olaf as a scary adult, rather just a clueless one. The three children offer great work, especially Browning and Aiken who each show skills that at times usurp those of the grandstanding Carrey. Streep and Connolly are, well Meryl Streep and Billy Connolly, and that is, of course, a great thing. It is likely that we will see another installment of Lemony's world and I welcome it. I think that this first film was an exercise to get things started and that perhaps next time around we will already be familiar with the characters and start to see fleshed out story arcs rather than just a fast-paced introduction. Image Transfer Review: The visual style of Lemony Snicket's A Series of Unfortunate Events is truly something to behold with the production design and cinematography working together to create a world with gothic structures and heavenly skies. The DVD transfer does a fine job of presenting the 1.85:1 anamorphic widescreen image. The dark colors come across well in the transfer with no bleeding evident or edge enhancement. The image does appear to be soft at times but this is likely a stylistic choice rather than a flaw as everything else about the transfer is reference quality. Sharpness and detail are each done extremely well, look at the final act featuring Aunt Josehpine's house on the cliff for ultimate proof. This is a flawless transfer. Audio Transfer Review: The Dolby Digital 5.1 mix is just as good as its visual counterpart. The dialogue is crisp and clear throughout with the left and right speakers reinforcing the musical score nicely. The rear speakers are offered a lot of activity with the musical score and ambient effects. Finally the .1 LFE track offers some nice and tight bass that when used, largely in correlation to the score, will give your sub a workout. Extras Review: I was skeptical when I saw that this was being presented in a two-disc collectors edition, thinking of course that the technical material would outweigh the children-oriented material. I was wrong. The first disc features not one but two commentary tracks, the first featuring Silberling solo while the second features Silberling and "the real Lemony Snicket", who sounds a lot like author David Handler. The first track is the winner as Silberling discusses the adaptation process, casting, avoiding using computer generated graphics, and the manner in which he presents the story. The second track is certainly geared more toward kids as Handler adopts an Olaf-like accent and takes things down a more joke-filled road. There is nothing to be learned here but younger audiences may enjoy it. The remainder of the disc is divided into two sections. Bad Beginnings contains the featurettes Building a Bad Actor, Making the Baudelaire Children Miserable, and Interactive Olaf. These include looks at the genesis of Olaf's numerous characters, the casting of the children, and the hours of make-up and prosthetics Carrey had to go through each day. Fun, but not much more, really. Orphaned Scenes are 11 deleted scenes including an alternate ending that posts a different resolution for Count Olaf. The remainder of the excised scenes may have helped to flesh out the characters some, but they were rightfully excised as they would have stalled the pace of the film. The 14-minute selection of outtakes are quite funny and certainly worth a look. This is where the special edition set distinguishes itself from its peer as the entire second disc is essentially a two and a half hour documentary entitled A Terrible Tragedy: Alarming Evidence from the Making of the Film. This expansive look through the making of the film covers everything from production design, special effects, the score, the sound mix, special effects, and other various aspects of the production. This comprehensive piece includes interviews with nearly everyone involved in the project, but first and foremost is Silberling as he guides us through the costumes and sets, from design to completion. We also explore the creatures created for the reptile room sequences, the visual effects, and how CG was used to make a digital baby. Interesting stuff. There is also a still gallery of production photos, costume designs and pre-production sketches. 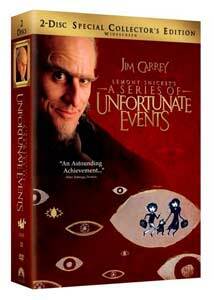 Lemony Snickets A Series of Unfortunate Events is one of the best family films of 2004 and certainly looks to be one of the best DVDs of 2005. The film itself is a showcase of fantastic sets, cinematography and terrific performances, while the DVD boasts a wide selection of bonus material as well as great transfers. Highly Recommended.